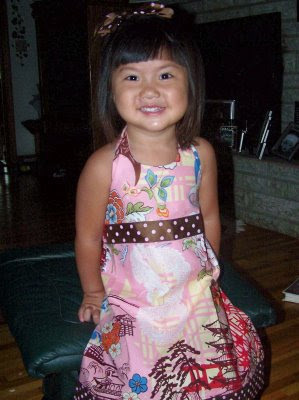 Annah was adopted when she was 20 months old and her special need was listed as VSD/ASD repaired. All I knew at the time was these were heart issues and anything involving the heart sounded scary to me, but when I looked in the eyes of this child I just knew she was our daughter and we would deal with whatever the future held for her. Like anything else I found that through a lot of research the more you get familiar with something the less scary it is and the more comfortable you get. I joined the yahoo group for heart issues which I highly recommend, I contacted families who had adopted children with heart issues, contacted two pediatric cardiologists and did as much research as I could. What I found is VSD/ASD is a very common heart defect which can be either minor or quite complex. Our daughter’s fell in the minor category but this was things we learned after we traveled and brought her home . Upon returning home we had her evaluated and found the repair done is China was top notch and that she has no restrictions what so ever, in her daily life. Other than the scar on her chest there is know trace that she ever had a heart defect. She has hit all her milestones and is a true joy in our lives. We are so happy we didn’t let something that sounded so scary get in our way of bringing our Annah home. People ask me all the time if I would ever adopt another heart baby and my answer is YES absolutely! Just do your home work, talk to as many families as you can with experience with the need, find a Doctor your comfortable with and follow your heart.